SoulfulDetroit.com is please to announce the dedication of the Darrell Banks Memorial Bench on Saturday, July 17, 2004 at 1 PM at historic Detroit Memorial Park in Warren, Michigan. The cemetery is located on the south side of 13 Mile Road in Warren, Michigan, just west of Ryan Road. Please congregate at section 36, which is located in the back SE corner of the cemetery. An informal get-together at a Café [location to be announced] will follow the dedication. All are welcome to attend the dedication and get-together. The Darrell Banks Memorial bench is a tribute to one of Soul Music’s finest singers and now adorns his formerly unmarked grave. It was made possible through donations by fans of his music from around the world. 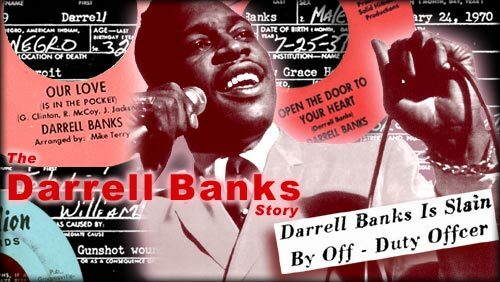 Darrell was born Darrell Eubanks in Mansfield, Ohio on the 25th of July 1937. Within a few years his family moved to the East Side of Buffalo, New York, where he was raised in the Gospel tradition. In the mid-sixties he met up with local dentist and music fan, Doc Murphy who gave him a chance at Club Revilot in downtown Buffalo. Spotting that Banks was a special talent, Murphy, who was now Darrell's manager, linked him up with Lebaron Taylor who had formed Solid Hitbound Productions with Don Davis in Detroit. Darrell’s first song called “Open the Door to Your Heart” was penned by himself and fellow Buffalo resident Donnie Elbert. It gave the label an astonishing chart debut in July 1966, reaching #2 in the R&B Charts. After one more release on Taylor’s Revilot imprint, Darrell moved to Atco/Cotillion, and finally to Volt records in Memphis who issued the highly respected “Here to Stay” album, which was recorded in Detroit’s United Sound Studio. Several weeks after his Volt release the front page of the Michigan Chronicle carried this shocking story. "A bullet fired by an off-duty policeman ended the life of singer Darrell Banks, who made history amongst his peers in the entertainment field several years ago, when scoring a million-seller hit with "Open the Door to Your Heart". After the funeral, some of Detroit's top performers, including Motown's Martha Reeves and the Vandellas, staged a benefit for Bank's family. The Chronicle reported that it "drew a turn away crowd". This was a tragic end to a promising career, but it was not the end of Darrell’s story. 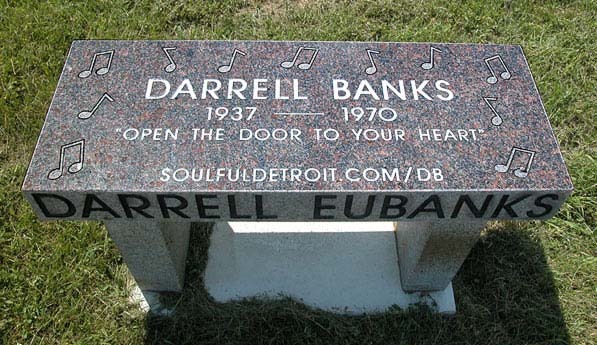 In England, the underground Northern Soul scene continued to play the music of Darrell Banks, and his contemporaries, and 33 years later several fans, from Scotland, England, Ohio and New York came to pay their respects at his grave in Detroit Memorial Park. Tragically when searching for the grave they had to seek the help of DMP employee James Norman, as there was no marker to be found at Section 36, Plot 539. James paced out the grave from the edge of the nearest marker and found a small identifying disc lying inches beneath the grassy surface. The stunned group decided at that moment that something must be done to properly commemorate someone who had given so much pleasure, to so many people, around the globe. Within a few weeks the funds were secured via an appeal on the Forum Members of Internet website SoulfulDetroit.com. On Saturday 17th July 2004, we will gather to formally dedicate this memorial bench and say a final farewell to this astonishing talent. SoulfulDetroit.com is designed and managed by the Internet Design company AtDetroit, LLC. AtDetroit, LLC is a multimedia communications solutions company formed by partners Lowell Boileau and Susan Kramer that specializes in internet, graphic, and print media solutions. @Detroit is incorporated in the State of Michigan, a member of the Farmington/Farmington Hills Chamber of Commerce and the Graphic Artists Guild.